The X-Trans CMOS sensor does away with an optical low-pass filter, and can resolve an impressive amount of detail without being prone to unpleasant artefacts. This is shown in our tests, with the camera making full use of its 16-million-pixel resolution, recording impressive amounts of detail even at high ISOs. Indeed settings up to ISO 3200 are very usable indeed, although some fine low-contrast detail will be lost. Dynamic range is pretty good at low ISOs, and the sensor continues to perform well as the sensitivity is increased. The camera’s DR settings are on hand to make best use of this, by helping the user avoid highlight clipping in high-contrast lighting. One area where the X100T excels is in its JPEG colour rendition. In the default ‘Provia / Standard’ mode it delivers attractive, true-to-life colours, and other settings deliver different, but still generally well-judged palettes. Auto white balance can err towards the cool side, although rarely to an unpleasant degree. Images from the X-Trans sensor tend to look different at the pixel level from conventional Bayer sensors, and some Raw converters handle the files better then others. So it’s worth experimenting in order to find a program that best suits your needs. 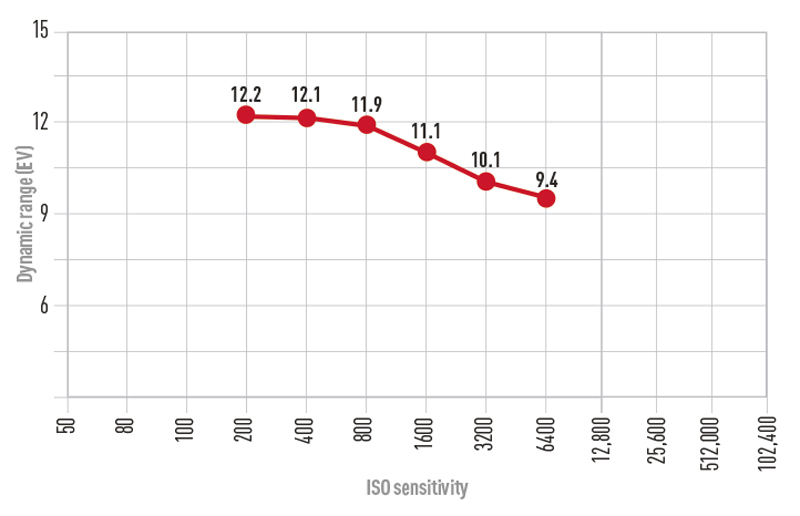 The X100T resolved a maximum of around 3200 l/ph on our Applied Imaging test chart, which is about as much as its 16MP sensor could theoretically achieve. There’s some false detail at higher frequencies, but nothing visually troublesome. Resolution falls as the sensitivity is increased, to ca. 2800 l/ph at ISO 800, and 2600 l/ph at ISO 3200. At the three highest settings (only available in JPEG mode) resolution deteriorates quickly. These tests were shot at the lens’s optimum aperture of f/5.6. 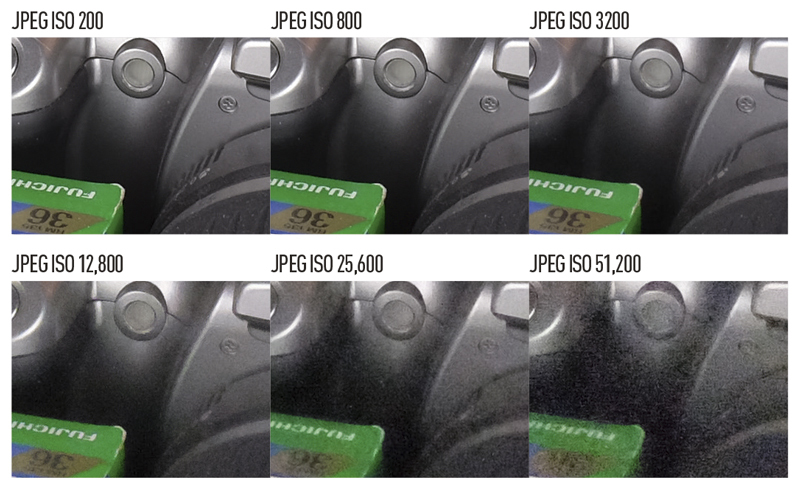 The X100T only records Raw files from ISO 200 to 6400, so these graphs cover a relatively limited sensitivity range. The X-Trans CMOS delivers very creditable results, with a peak dynamic range of 12.2 EV at ISO 200 according to our Applied Imaging tests. What’s impressive, though, is how well DR is maintained at higher sensitivities, with 10.1 EV at ISO 3200 promising very usable images. 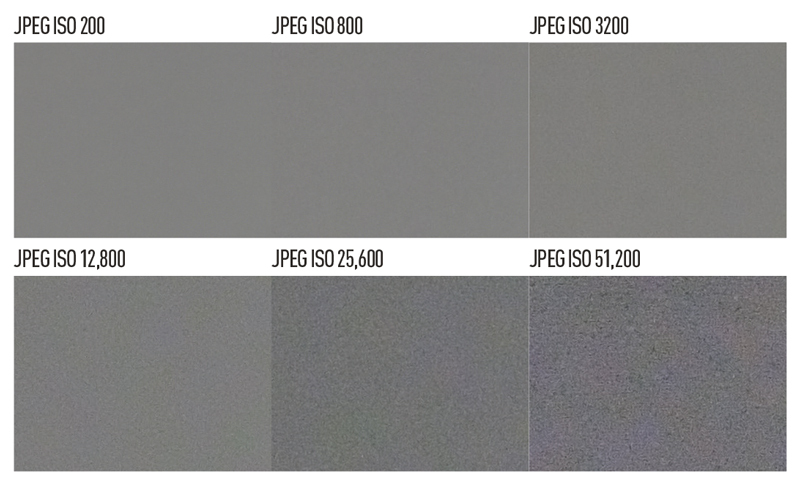 Even ISO 6400 should be fine for less-critical purposes, although shadow noise is likely to become more obvious. 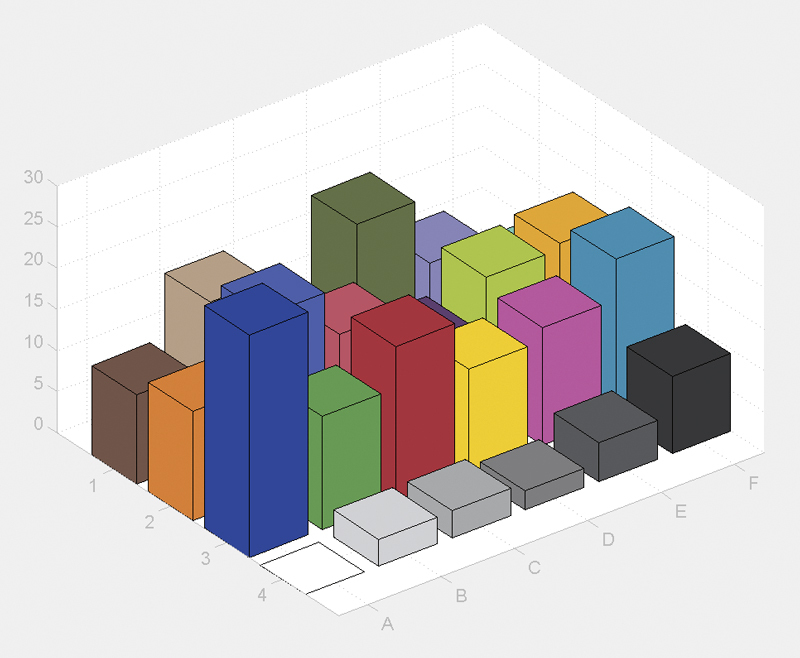 This 3D graph compares the colour shift from the reference colour to the photographed chart: the higher the peak, the greater the shift from the original. In the default JPEG setting, the X100T shows a relatively neutral colour rendition, but saturation is increased somewhat across the board, giving attractive-looking images. Fujifilm offers extensive colour controls – additional ‘Film Simulation’ modes include Velvia / Vivid for a much more saturated, punchier look, and Astia / Soft which gives slightly more muted colours. Additional ‘Pro Neg’ modes are optimised for portrait shooting. Colour output can be further fine-tuned to your taste, either in the menu or during in-camera Raw development. The images above have a resolution of 300ppi, reflecting a high-resolution print. The X100T gives sharp, detailed images at base ISO, and its image quality holds up very well to ISO 1600 at least. There’s an increase in noise if you look closely, but both colour saturation and fine detail is maintained well. Shadow detail starts to degrade at ISO 3200, but even so both it and ISO 6400 are still acceptable. 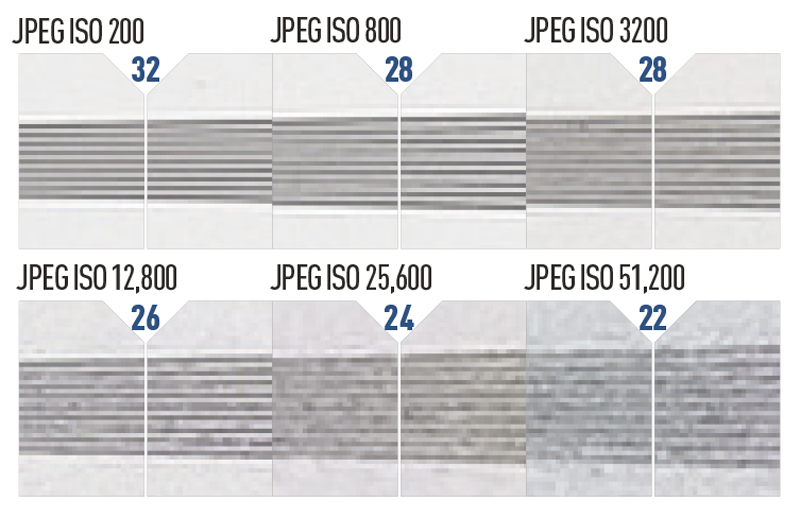 Image quality deteriorates at the top three, JPEG-only settings, and while ISO 12,800 is just about usable, ISO 25,600 and 51,200 are best left alone. Adobe Camera Raw was unable to open the X100T’s files at the time of writing, so we examined them in Fijifilm’s Raw File Converter EX. Again, this showed excellent results at ISOs up to 1600, but lower quality at ISO 3200 and 6400. The grey-card images above are JPEG files shot with the X100T’s default noise reduction and colour settings applied. The images are presented at 300ppi to reflect the noise that would be experienced when printing. We see very clean images at ISO 200, and while some luminance noise appears at ISO 800, you won’t really see it in print. Noise is still mostly well-suppressed at ISO 3200, but a little low-frequency colour blotching starts to appear. This is amplified at higher ISOs, and while ISO 12,800 isn’t terrible, the two highest settings show it clearly.